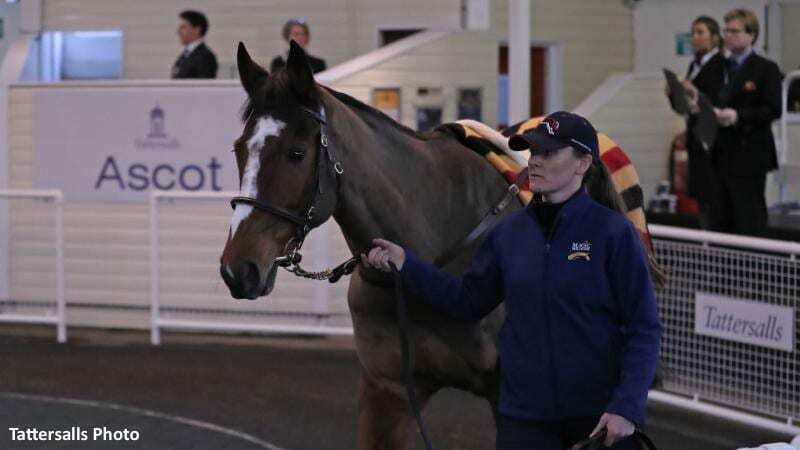 Lot 149, Gennady, sells to Tom Malone, agent, for £37,000 ($46,514) at the Tattersalls Ascot December Sale. The 2018 sales season in the Tattersalls Ascot Sales Arena concluded with the December Sale producing an aggregate of £541,150 (US$680,258), a median of £3,200 ($4,023) and an average of £5,882 ($7,395). Headlining the sale was Lot 149, Steven Crawford's 4-year-old Arakan gelding Gennady who was placed on his only start in a Bumper at Ayr. The promising youngster caught the eye of agent Tom Malone and the hammer fell at £37,000 ($46,514). A winner at three, Kings Highway (Lot 91) proved sought-after when the son of Shamardal was knocked down to trainer Ivan Furtado for £32,000 ($40,229). The colt boasts an impressive family being out of an own-sister to Beat Hollow and Ancient Culture and was sold by the day's leading consignor Godolphin. Lot 130, Nothing Man, only had one appearance on the track when finishing fourth in an Ayr Bumper for Steven Crawford and Stuart Crawford. By Ask, the promising 4-year-year-old was sold to trainer David Dennis for £26,000 ($32,681). Hurricane Arcadio, Lot 137, showed promise when placed 3rd, beaten only three and a half-lengths in a 4-year-old Maiden at Rathcannon for Seamus Spillane and heads to Michael Blake Racing after being sold for £22,000 ($27,653) by Spillane's Kilclare Stables. This entry was posted in Bloodstock and tagged David Dennis, Gennady, Godolphin, horse auctions, Hurricane Arcadio, Ivan Furtado, Kings Highway, Michael Blake Racing, Nothing Man, richard pugh, Seamus Spillane, Steven Crawford, Stuart Crawford, Tattersalls, Tattersalls Ascot December Sale, Tom Malone by Edited Press Release. Bookmark the permalink.